One of the most important aspects of a business is ensuring that the employees stay happy. When you don’t have happy employees, you’ll have a higher turnover rate, more complaints, and decreased productivity. No one likes working at a facility where their concerns aren’t taken into consideration, especially when it comes to payment. Payroll services are some of the most vital benefits of a business. If your payroll services aren’t in order, then you’ll have some very dissatisfied employees. Did you know unhappy employees mean that you’ll end up shelling out more money than you would with satisfied ones? When there is a high turnover rate, you’ll end up paying for it. Due to dissatisfaction, an employer will lose out on finances on settlements, lost revenue because of hiring new employees, and other damages because of unhappy employees. Besides taking your employees consideration into mind to maintain a happy work environment, it’s important to have reliable payroll services to ensure each employee is getting paid their dues. If you’re a new or an old business and are looking for new payroll services, then you’ve come to the right place. These questions will help you pinpoint who the right payroll service company is for you. It’s important that you take the time to figure out the right service for you, so you can ensure your employees are happy. Regardless if you have a small or a big company, deciding on the payroll services will help ensure steady satisfaction with employees. If you hire an unreliable payroll service and paychecks are late, remember that your employees will be looking to you to know what’s going on. What’s An Overview Of Your Services? 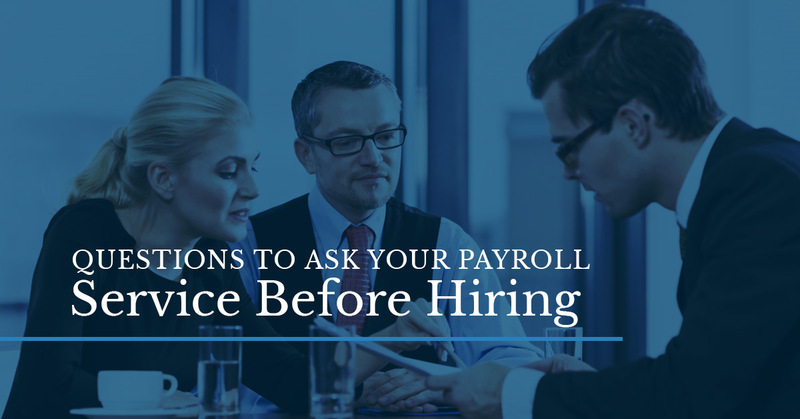 The first and foremost question you need to ask before you dive too deeply into figuring out if the company you’re inquiring about is the right fit for your business is to ask about the overview of payroll services. If the payroll services don’t match up with what you’re looking for, then you can move on to the next company. By asking about an overview of the services, you can decide if this is what’s best for your company. At Journey Business Solutions, our payroll services are centered around giving your employees what they deserve. Without reliable and secure payroll services, your employees will become very unhappy. With bills to pay and responsibilities to tackle, without dependable services your employees will begin to look elsewhere for work. Journey Business Solutions makes payroll services easy by employing industry experts who know exactly how to cater to your business. If you’re a startup company, then looking at pricing for services is imperative. As a startup, you still don’t have the revenue that you need to have all of the services you’d like. Unless you have investors who are funneling your money for your startup, it’ll take some time to determine how to spread your finances while getting the most bang for your buck. At Journey Business Solutions, we strive to make our payroll services as affordable as possible. With low-cost payroll services, we open the doors to new businesses who are trying to get a footing under them. Taxes can be exceptionally difficult for those who just don’t work with them that often. As a business owner, you need to know the ins and outs of taxes as well as the payroll taxes. However, as your payroll service, we need to know about payroll taxes as well. To ensure that the correct amount of payroll taxes are implemented and that everything is on-time, it’s vital that you ask about how the potential company handles them. If they don’t follow the proper payroll tax compliance and the vendor relies on you to process the end of the year taxes for the employees, then you’ll know the company isn’t the right one for you. Journey Business Solutions prides ourselves on handling payroll taxes the proper way and following all of the compliances, so we don’t miss out on anything. Security is so important these days to keep everyone’s information private and protected. If the payroll service company doesn’t have the best security, then we recommend finding another company. Secure data will be protected from hackers gaining the personal information of your employees. Without security in place, critical payroll data can be swiped and identity theft can take place. The payroll services at Journey Business Solutions are secure by the technology we implement. We know the risk that can happen if the necessary steps aren’t taken to protect the payroll data, which is why we’ve managed to secure payroll information with the highest protective standard encryption technology. For any questions or concerns, it’s important that you know who to ask. Do you have one person whom you speak to or do you have a new one every time you call the company? More importantly, are the customer service representatives informed and willing to help you work out the problem? The best companies excel in customer service and at Journey Business Solutions we’re happy that we comply with that guideline.